Those lucky enough to see Yaroslavl for the first time at daybreak call it the pink city. An ancient Russian settlement with a 1,000-year history, it is also one of the Golden Ring’s eight towns. 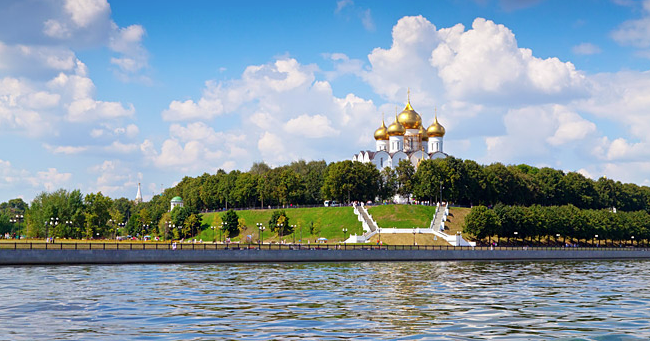 Vibrant layers of history and culture make Yaroslavl a great destination for a time travel through the centuries. Yaroslavl’s center (282 kilometers from Moscow) is included on the list of UNESCO’s World Heritage Sites and is the birthplace of the first Russian theater. But that’s not all there to see in this unique and vibrant provincial town. RIR has developed a special route to take you to the city’s key sights from the 13th century through the 21st. The most ancient structure in the city is the Transfiguration Monastery, which was erected on 13th-century foundations. It was one of the favorite monasteries of Ivan the Terrible and was turned into a museum 150 years ago. There are six churches open to the public on the territory that has been created to resemble 18th-century regional architecture. The artists who painted the monumental landscapes were the first in the history of Russia to sign their work setting an example for future generations of talented Russian artists. Here you can see numerous ancient Russian icons and the very first printed edition of "The Song of Igor's Campaign," Russia’s most famous literary achievement of the Middle Ages. A 27-year-old bear, Masha, lives on the premises in a special enclosure with its own bath and amusements. She represents the symbol on Yaroslavl’s coat of arms of a brown bear characteristic of Russia. Masha has a temper and is not what one would call an easy-going bear: 10 years ago she bit off the foot of one of her keepers. No visit to the Yaroslavl Museum-Preserve is complete without a walk up to the belfry of the Museum-Preserve to take in a breathtaking panorama of the city. Take a pair of binoculars to check out a pearl of ancient architecture - the Church of St. John the Baptist - from the belfry of the Yaroslavl Museum-Preserve. A view of this church is familiar to every Russian as it is depicted on the 1,000-ruble banknote. UNESCO encourages tourists to take a closer look at this church. Its exterior is a fantastic silhouette of a huge Orthodox Church with 15 domes. The interior is peerless in the world of art with tiles, patterns and paintings depicting an encyclopedia of Biblical scenes. Practically the entire population of the city and the surrounding area participated either financially or physically in its construction in the 17th century. This club and restaurant features delicious Russian food and bright design in tribute to one of the Soviet Union’s most famous comedies, "Ivan Vasilievich: Back to the Future." The interior is recreated to humorously resemble apartments of the 1970s and chambers of the era of Ivan the Terrible. Its price, when compared to Moscow restaurants, is a nice surprise. The oldest theater in Russia began with performances by young activists in a Yaroslavl tanning barn 250 years ago. Soon Fyodr Volkov, the leader of the group and the son of a merchant, was summoned by Catherine the Great to St. Petersburg. The founder of the first Russian theater never returned to the city. However, his mission continued in Yaroslavl, and now the Volkov is one of the biggest and most famous theaters in provincial Russia. Several years ago, the theater began orienting itself towards contemporary playwrights and young directors. It has become one of the best places to see innovative theater performances in contemporary Russia. This house was built in the 19th century for Emperor Alexander I as a resting palace when taking long trips. It later became the official residence of the governor, and now hosts one of Yaroslavl’s best art museums. The pride of the museum is its rich collection of examples from the Yaroslavl school of icon painting. Other notable exhibits include provincial portraits, works from the Parisian period of famous Russian artist Konstantin Korovin and canvases by Russia’s avant-garde. The museum annually hosts many events, lectures and exhibitions. Five years ago during a renovation, an arc from a secret underground passage from the Governor's house to the grotto under the observation deck of the Volga embankment was found. Twenty years ago the museum was given an award recognizing it as being the best provincial museum in Russia. This museum is very popular among foreign travelers to Russia. Here one can find the largest public display of antiques anywhere in the country. The collection includes vinyl records and gramophones, bells and chimes, irons and samovars, music boxes and phonographs. A private museum, Music and Time was founded 22 years ago by the collector, actor and magician John Mostoslavsky. If you’re lucky he will personally guide your tour, which turns the exhibits into a real show. Before this controversial sculpture was created, only Christ was allowed to be depicted in stone according to Orthodox traditions. Exceptions were made for a small number of saints and historical figures such as Prince Vladimir and St. Sergius of Radonezh. Yaroslavl’s most famous modern artist and a member of the Presidential Council for Culture, Nikolai Mukhin, and his colleague Treivus have created something stunning - a stone-carved portrait of Trinity angels that visit Abraham and his wife. It is a scene from the Old Testament. The sculpture is a bold attempt to interpret the great sculptural icon by medieval icon painter Andrei Rublev that bears the same name. It is Russia's only sculpture of the Holy Trinity. It is impossible to gauge how people would have reacted to such a violation of the religious canons in the past. However, the sculpture was consecrated by the former Patriarch of Moscow and All Russia, Aleksiy II. Today the monument is considered one of Yaroslavl’s top five attractions. The sculpture was installed 20 years ago and shortly thereafter became a traditional place for newlyweds to make a wish and throw a coin into a cup. Today a park arrow marks the place where the Volga and Kotorosl rivers meet - the very spot where Yaroslavl was founded 1,000 years ago. This arrow points in the direction of the best route for exploring the city’s main promenade - the Volga embankment. Along the way you will see the sculpture of the Holy Trinity, the Damansky Bridge leading to the amusement park, and the so-called "Temple of Love." This elegant 19th-century garden bench was built on the site of a Chinese pavilion. Locals say that back in the day Yaroslavl’s governor liked to come here to drink tea and share it on Sundays with anybody that came. Today this is a popular meeting spot for couples, to take wedding photos and to even propose marriage itself. Recently the city authorities banned the fastening of locks here, a popular ritual on wedding days, because they impede the surrounding views of the late classicist architecture. As an alternative, newlyweds have started planting "trees of love." But the place is still symbolic and lovers come here to kiss and spin around on the grass in anticipation of a happy future together. The gazebo of love is one of the best places in Yaroslavl to view the Volga.